Perhaps the work that takes the most liberty with the Arthurian legend, and therefore, opens itself to create larger roles for Arthur’s children and descendants is The Keltiad series by Patricia Kennealy-Morrison (widow of Jim Morrison). The author intended to write eighteen novels in the series, but after publication of the eighth novel, the publisher HarperCollins decided to drop the series. The Arthurian world of these novels is placed in outer space, allowing the stories a freedom beyond a typical medieval setting in Britain. The premise behind the series is that a group of Keltic people left earth in 453 C.E. in their spaceships and travelled to outer space to create a new kingdom, Keltia. 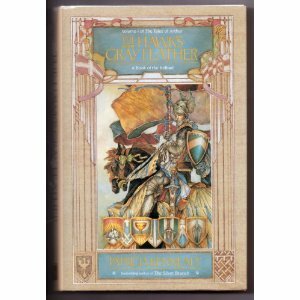 Only three novels in The Keltiad series deal specifically with Arthur and are known as the “Tales of Arthur”; they include The Hawk’s Gray Feather (1990), The Oak Above the Kings (1994) and The Hedge of Mist (1996). The plot of this trilogy is long and complicated, but the length provides for an extensive treatment of Arthur’s descendants and their history. At the opening of the “Tales of Arthur” trilogy, some fifteen centuries have passed since the Kelts first left earth in the fifth century. The nation of Keltia is now divided between the royal House of Don, which is in exile, and the evil Archdruid Edeyrn who has usurped the kingdom. The plot of the first two novels is how Arthur, heir to the House of Don, regains the kingdom. Arthur has four children over the course of this trilogy, although none of these children is Mordred. There is a character, Mordryth, who is Arthur’s nephew, the son of his evil half-sister Marguessan, but although Mordryth is a villain, Arthur outlives his nephew. Arthur’s own death is in a sort of black hole where his spaceship becomes trapped. Even though he disappears from Keltia when he enters this black hole, Arthur promises his people he will return. The Kelts decide the throne will pass to Arthur’s heirs, but the ruler will always hold the kingdom as a type of regent until Arthur’s return whenever that may be. The first child born to Arthur is Malgan in The Hawk’s Gray Feather. During the wars with Edeyrn, Arthur takes a mistress named Gwenwynbar, who follows him about on his campaigns. However, Arthur’s men do not like Gwenwynbar, and because Arthur will not make her his queen, she decides to leave him and join his enemies’ side. Soon after, Gwenwynbar becomes the wife of Owain, who is Edeyrn’s heir. Seven months after this marriage, Gwenwynbar gives birth to a son, Malgan. Throughout the remainder of the trilogy, the question remains whether Malgan is Arthur or Owain’s son. Unfortunately, the genealogy charts at the end of the book give away the suspense by showing he is Arthur’s child. After Arthur defeats Edeyrn and Owain, Gwenwynbar plots against Arthur, but her plots are discovered and she is put to death. Arthur adopts and raises Malgan, wanting to believe the boy is his own. Malgan, however, grows up holding a grudge against Arthur for the death of his mother. Malgan soon joins his evil aunt Marguessan in her plans to take over the kingdom. Arthur tries to reconcile with Malgan, but eventually, they battle and Malgan is slain while Arthur survives. In The Oak Above the Kings, Arthur marries his cousin, Gweniver, but their marriage remains without issue for many years. Now that Edeyrn is defeated, Arthur seeks to punish those foreign nations which allied themselves to Edeyrn. During this campaign, Arthur visits the planet Aojun and has an affair with the princess, Majanah. Their relationship produces a daughter, Donah, who divides her time between the worlds of Aojun and Keltia. When Marguessan steals the Grail, Donah adopts the role traditionally held by Percival’s sister in Arthurian legend of the female who assists in finding the Grail. Donah also assumes Guinevere’s traditional role of being kidnapped by Melwas. When Donah reaches adulthood, she marries a man named Harodin, and we are told she has “three children, including her heir, Sarinah” (Hedge 449). After Donah’s mother, Majanah, dies, Donah becomes the next queen of the planet Aojun. After many years of barrenness, Gweniver also produces children for Arthur, first a son, Arawn, who after Arthur’s death, becomes king and is thought “a worthy successor to his great parents” (Hedge 432). Gweniver also gives birth to a daughter, Arwenna, who is not born until after Arthur’s death. While the novels do not say much about these children’s futures, the genealogy charts indicate that Arawn has a child, Arianwen, who rules Keltia after him, and Arianwen also has children. Arthur’s daughter, Arwenna, has a child named Blythan, who also produces children. Finally, the charts indicate that Donah’s heir, Sarinah, also has descendants not pictured on the chart. Kennealy-Morrison’s novels, therefore, create an extensive family tree that continues beyond King Arthur, providing for his descendants to succeed him as rulers of the kingdom. 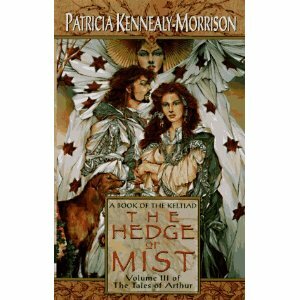 Toward the end of The Hedge of Mist, Taliesin, Arthur’s brother-in-law and the novels’ narrator, has a vision of the future, in which he sees a great queen who will look like Arthur and Gweniver from whom she will be descended (287). Though not named, this queen is doubtless Aeron, the heroine of another of the Keltiad trilogies, the “Tales of Aeron,” which were written before the “Tales of Arthur” but chronologically follow the “Tales of Arthur.”The novels in the “Tales of Aeron” also contain more genealogy charts which detail Aeron’s descent from Arthur and Gweniver for over nine generations. 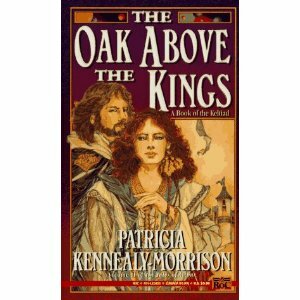 Because these novels do not deal with Arthur or his children specifically, they will not be discussed further, but they do continue Kennealy-Morrison’s vision of an Arthurian family tree that extends centuries after Arthur’s passing. By setting her novels in outer space, Kennealy-Morrison does not provide Arthur with a bloodline that connects him to the humans of twentieth century earth. Rather the “Tales of Arthur” novels take place in the twenty-first century, while the “Tales of Aeron” are set in the thirty-fifth and thirty-sixth centuries. However, this outer space setting is also what leaves the novels open for such extensive creation of descendants for Arthur, providing interesting possibilities for the legend, even if they are greatly removed from the traditional story. Based on the live-action television series. Hardcover. Illustrated by Helmuth Wegner. I wrote several blog posts earlier this year about the 1950s television series, The Adventures of Sir Lancelot. Not until I found the television series on Amazon last year did I ever get to watch it, but I’ve been familiar with the series since the late 1990s when I found in an antique shop a copy of the Big Little Book Sir Lancelot by Dorothy Haas, a tie-in with the television series, although not including the “Adventures” part of the name. Having watched the television series, I decided to go back and read the book. Many of my readers will remember the Big Little Books series which was printed in the 1950s-1980s and popular during my childhood. The books have text on the left side and an illustration on the right hand page. They run between 200 and 300 pages – this book is 276 pages. This book is the only one I know of based on a television series, while most of the books were based on comic strips such as Mickey Mouse, Popeye, or the Pink Panther, superheroes like The Fantastic Four or The Incredible Hulk or popular culture movie characters like Tarzan and the Lone Ranger. I’ve always been fond of Big Little Books and still have a collection of several from my childhood. 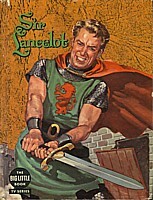 The story of Sir Lancelot is not a repeat of any of the television episodes, but its plot is typical of the the TV series. Sir Lancelot and his squire Brian are at a tournament where Lancelot is defeated by a mysterious knight. Soon they are on an adventure when King Arthur sends Lancelot to investigate some raids in the Duke of Albemarle’s land. It turns out the duke has died and his son Garth is now the duke, but the Girth of Garth, a special belt signifying clan leadership, has gone missing. Lancelot and Brian must determine who the raiders are and get back the belt. In the process, they participate in a battle and Brian is attacked by a boar. Of course, all ends happily. There is some slight humor in the story but nothing about it is remarkable. Surprisingly, no effort was made in the book’s illustrations to make Lancelot on the cover or the interior illustrations look anything like the series star William Russell. Nor does Brian look like his television counterpart. None of the illustrations really stands out, though they lack the cartoon look of most Big Little Books, and are colored in simple shading of one color each of blue, green, or yellow (By comparison, the earliest Big Little Books had fully colored cartoon illustrations and later versions were just black and white drawings). It’s also curious that the series ran from 1956-1957 but the book was not published until 1958. Sir Lancelot is far from a great addition to Arthurian literature; it is a fun little, or should I say Big Little book, to read, but it’s also a rare case where the television series was better than the book. Despite the book’s flatness, author Dorothy Haas has had a very successful career as an author and editor and this was one of her first books. You can find out more about her at: http://www.illinoisauthors.org/authors/Dorothy_Haas. Among her other works were two Wizard of Oz books in the 1980s. If you search online, you might be able to find a used copy of Sir Lancelot and the television series is available and worth watching.